Interested in learning how to more effectively talk to legislators about policies that affect our communities? 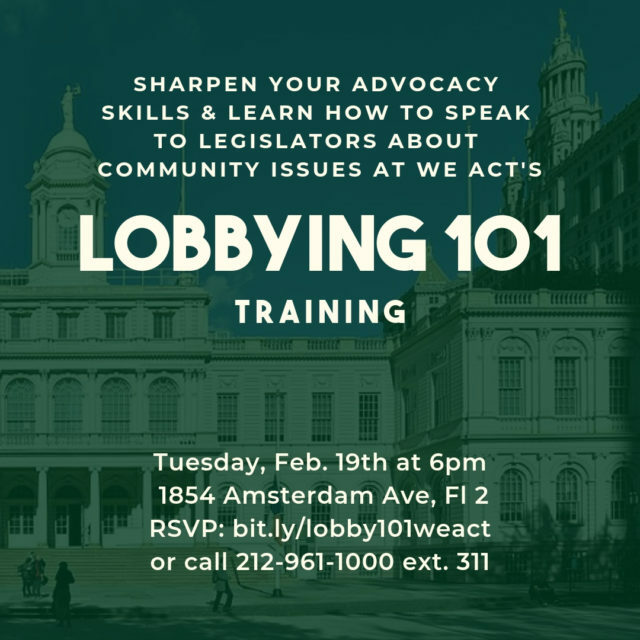 Come to our Lobbying 101 Training and sharpen your advocacy skills! This workshop will be led by WE ACT’s Environmental Policy and Advocacy Coordinator Stephan Roundtree, Jr., who has years of experience lobbying City & State legislators. And if you are wondering why it is important to learn how to lobby your legislators, WE ACT Planning Committee Member Ronald Thomas – a veteran of many trips to the State House and City Hall – wrote a wonderful blog post about his experiences. If you are interested in attending, please RSVP!